Just imagine, thousands of bicycles with baskets of flowers being ridden through the streets of your town. What an incredible sight that would be! While sitting at my desk, at Fly Me To The Moon Florists, I began to wonder what our city would look like if everyone rode around on bicycles with baskets full of flowers. It would be like a daily parade without the crowds and the leftover garbage. 1. It would make people happy. Joyful even. Bicycles of all kinds bearing flowers of all colors, shapes and sizes. 2. The streets would look so beautiful. Bike riders would try hard to outdo others with their magnificent floral displays. 3. Flowery bicycles might just encourage more people to ride. We all need more exercise. The fact that I never learned to ride a bike should have no bearing on this case idea. My husband can get a two-seater and I'll ride with him. Besides, I can stay behind and help arrange the flowers. See other pretty bicycle images on Pinterest here. Learn how to select and care for your fresh flowers here. 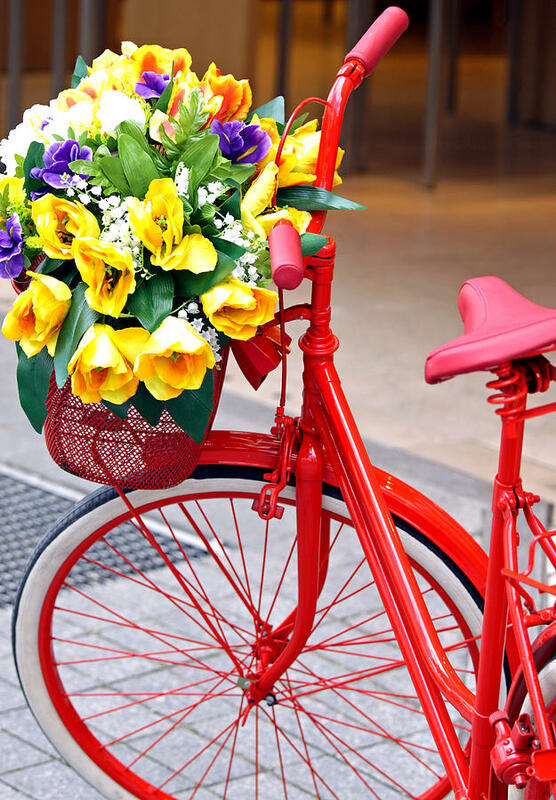 I'm sure there are plenty of other good reasons why bicycles should come with a basket of fresh flowers. I'd love to hear your reasons in the comments below. You can transform the look of a simple vase by lining it with fresh leaves. I use this technique in my floral design work at Fly Me To The Moon Florists. Wrapping a leaf on the inside of a vase works best with square, round or rectangular vases. You may need several leaves depending on the size and shape of your vase. Any soft and pliable leaf will do. Leaves - an aspidistra leaf, works best and can be purchased from a florist. 1. Select a leaf that is large enough to cover the entire vase. If the leaves are too small, you may have to use more than one leaf to completely cover the vase. 2. Remove any dirt on the leaf with a damp paper towel. 4. Bend the leaf into a circle small enough to fit in the vase. 5. Place the leaf in the vase and let it go. If it doesn't cover the vase completely, repeat steps 1-4 with another leaf. Position it either closer to the top or bottom to cover exposed area. Totally confused? Watch this very short video entitled, "Design Tip: Enhance A Glass Vase Design With Aspidistra Leaves." You can achieve a different look by using a long grass, like steel grass. Wrap it around your hand. Put your hand into a bubble vase and let it go. Move the grass around until most of the vase is covered. This technique doesn't require complete coverage. Please let me know what you think about lining vases with foliage for flower arrangements in the comments below. Never underestimate the power of a beautiful flower arrangement to set the stage for an elegant event. Do you like to create your own floral arrangements for the special events in your life? If your budget is tight, DIY is a nice option. The goal of this blog is to empower you to do your own flowers. You'll find many DIY floral design posts and links here. At our shop, Fly Me To The Moon Florists, we help a growing number of our customers create arrangements for their everyday enjoyment and special events. But, there's something about a floral arrangement created by someone with a great eye for design that can make your event so very special. I'm just saying. The beautiful arrangement above, by Fox and Rabbit, is both elegant and joyful. Everything I think flower arrangements should be. What do you think about DIY flowers vs floral designer creations? Let me know in the comments below. The key to buying supermarket flowers and making them look great is to buy them the day they arrive at the store. Just ask the manager what day they come in. Most supermarkets and fruit and vegetable stands do an okay job of taking care of the flowers when they first come in. But, while florists will re-cut the flowers. change the water and add floral preservative to prolong their vase life every few days, most stores don't bother. If you're not sure how to select fresh flowers or take care of of them, you may find these posts helpful. Please share your experiences with supermarket flowers in the comments below. Tired of the typical rose arrangements? Then let me introduce you to the magnificent garden rose. Garden roses come in a wide range of colors and some are intoxicatingly fragrant. Garden roses are so beautiful that they practically arrange themselves. You don't need a lot to make an elegant statement. Some people are lucky enough to have garden roses growing in their gardens. Just snip a few, bring them inside and enjoy. I'd love to hear about your experiences with garden roses below in the comments. I admit it. I'm a late adapter to the pink and turquoise color palette. But when a bride came in for a consultation with these colors and a touch of gold I fell in love. This beautiful turquoise basket of pink roses is a modern twist on a an old favorite. Blush pink blooms. A robin's egg blue cabinet. And the palest pink table create a lovely spring vignette. Make your bedroom a haven you'll love. Paint a forgotten nightstand a vibrant turquoise blue. Get a bunch of pink flowers and cut them short so only their blooms are showing. Add a lovely decal or stenciled design on the wall and put your favorite linen on the bed. You really don't need too much to make a special place in the corner of a room. A single pink flower in a bud vase. A beautiful remnant just the right size to cover that chair. A re-covered pillow in the palest pink satin. A throw and a journal or favorite book. What Would You Like to Do in This Flowery Setting? Besides a flowers shop and cafe, the Armchair Collective actually sells, well a wonderful selection of armchairs. Get a glimpse of this lovely store here. Their website is currently being re-worked. So, what would you like to see or do at the Armchair Collective? Please let me know in the comments below. Buy Yourself Fresh Flowers This Week! One winter, my husband and I went to Aruba in February. We had never gone anywhere warm in the dead of winter before. Our plane actually had to be de-iced before leaving New York City. It had been snowing. It was 89 degrees when we arrived in Aruba. I thought I had died and gone to heaven. It changed my whole perspective on life. Well, at least on surviving cold winters. The overwhelming oppression of having to wear so many layers of clothing to keep warm can really get to you. What does all of this have to do with buying yourself fresh flowers? Nothing really, accept that after weeks of face-freezing weather our bodies need a break. Having a bunch of fresh flowers in your home or office can do that for you. Though not quite the same as being transported to some island paradise, it can truly lift your spirits. I saw daffodils in the flower market on Monday. A clear reminder that even though winter's not over, spring is on the way. How do you keep your spirits up when you're wondering if winter will ever end? I know it's winter. For some of us that means frigid temperatures. But no matter how cold it may get, you can still have fun with flowers. 1, Make a cute little display like the one above from a post called, "Flowers At Home" by Radostina over at her delightful blog, 79 Ideas. 2. Buy brightly colored fresh flowers in cheerful colors and place them in small bottles or glasses around your space. 3. Find a vase that makes you smile and pop in a bunch of green spider mums or carnations. They'll last you 10 - 14 days if they're fresh and you take care of them. You can learn how to pick out the best flowers here. 4. Take a look at my pinboard called, Floral Vignettes for some inspiration. 5. Buy yourself a bunch of Gerbera daisies. They are so bright and fun on dreary days. Be sure to keep your fresh flowers away from drafts and sources of heat. They'll last longer and make you happy every time you look at them. What's your best tip for displaying flowers? Why Not Stick With Love?